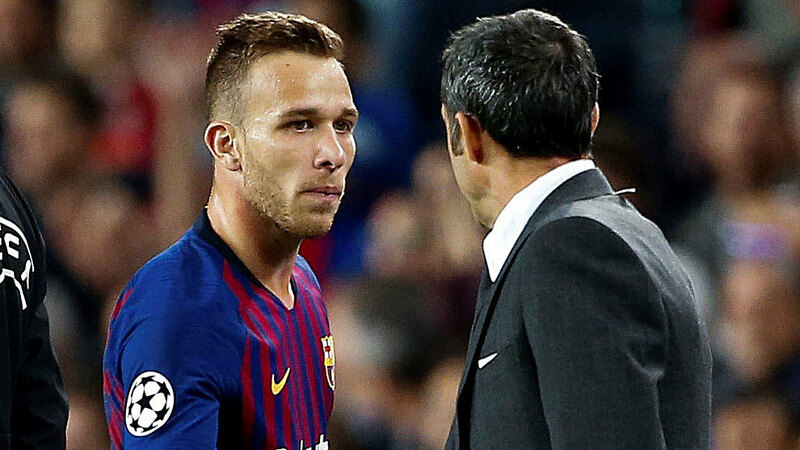 They say that what the public wants is sacrosanct, and the Camp Nou made clear exactly what they want during the clash with Inter: they want Arthur in the starting line-up. It’s as simple as that. In the 77th minute of play Ernesto Valverde elected to substitute the Brazilian for Arturo Vidal and the supporters responded with whistles. Valverde has spent almost a season and a half looking to fill the gap left by Neymar and then Andres Iniesta. At the time of his arrival, he resolved the issue of the Brazilian’s departure by using a flat 4-4-2 formation with Paulinho‘s arrival greatly aiding that endeavour. He also tried Ousmane Dembele when possible and there seemed to be a lot of experiments which simply didn’t succeed. This was made abundantly clear in Rome as record signing, Philippe Coutinho, was forced to watch as he was ineligible to play in the Champions League. This season, Coutinho has been readily available in all competitions, however Iniesta has not been. As such, it’s the former Liverpool midfielder who has played in the Spaniard’s position. His style isn’t comparable with the great Iniesta though. Valverde‘s starting line-up seemed clear with Coutinho and Dembele playing most matches, until the French winger showed that he still lacks the consistency one would associate with a more experienced individual. In these matches, the Spanish coach gave Arthur the chance to play and light at the end of the tunnel appeared. Barcelona were once again in control of matches, their midfield dominated proceedings and these performances moved away from the lack of consistency the Blaugrana have recently showed in which their shortcomings have been highlighted. Arthur was born to play for Barcelona. At times, in conjunction with Sergio Busquets, if it’s not too audacious to say, the Brazilian looked like Xavi. His touch is fast but sensible, he overcomes defensive lines and pulls opposing players this way and that. Following the departure of the two best midfielders Los Cules have ever seen, supporters clamoured to see another player in the same mould and treat him with huge affection. Arthur has been welcomed as that individual.